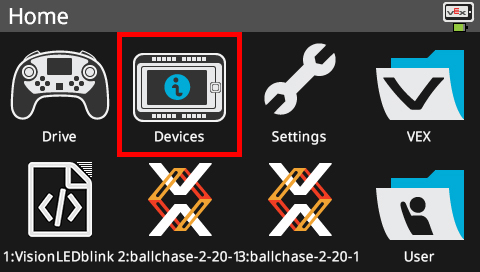 Tap on the Devices icon highlighted by the red rectangle in the image above. 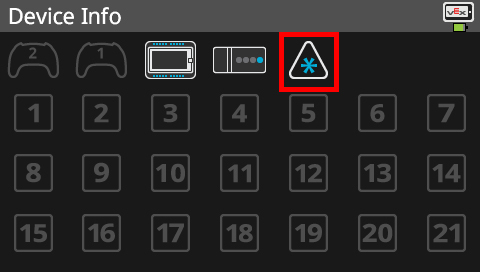 Tap on the 3-Wire ports icon highlighted by the red rectangle in the image above. NOTE: Each 3-wire Port is highlighted with its letter inside of a triangle. To change the 3-Wire port settings, press the screen on the corresponding port cell. 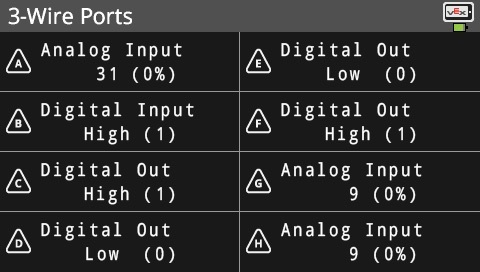 There are 4 settings: Analog Input, Digital Input, Digital Out High, Digital Out Low. 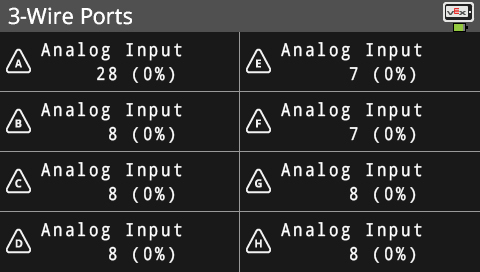 Analog Input: The brain will display the analog value from the connected VEX EDR sensor. Digital Input: The brain will display the digital value from the connected VEX EDR sensor. Digital Out High: The brain will generate a "high" (1) signal to send to the VEX EDR device. Digital Out Low: The brain will generate a "low" (0) signal to send to the VEX EDR device.